This Date in Seal Beach History | An ongoing history project exploring one Southern California beach town's colorful past — one day at a time. This blog project is devoted to exploring Seal Beach’s past one day at a time. It is individually run and maintained and is not affiliated with the City of Seal Beach or the Seal Beach Historical Society. If you want to share posts or images from This Date in Seal Beach, please credit the site and share a link back to us if possible. The writing is copyrighted and all rights are reserved, so please do not share the work done here as your own. If you enjoy the posts, the vintage photos, and the research shared on this blog, please consider making a small donation of a dollar or more to help defray the online subscriptions and other research costs that make this blog possible. This Date in Seal Beach History also has an online store hosted at Cafepress where you can order shirts, totebags, stationery, and other gift items imprinted with vintage Seal Beach images. Visit the online store by clicking here. 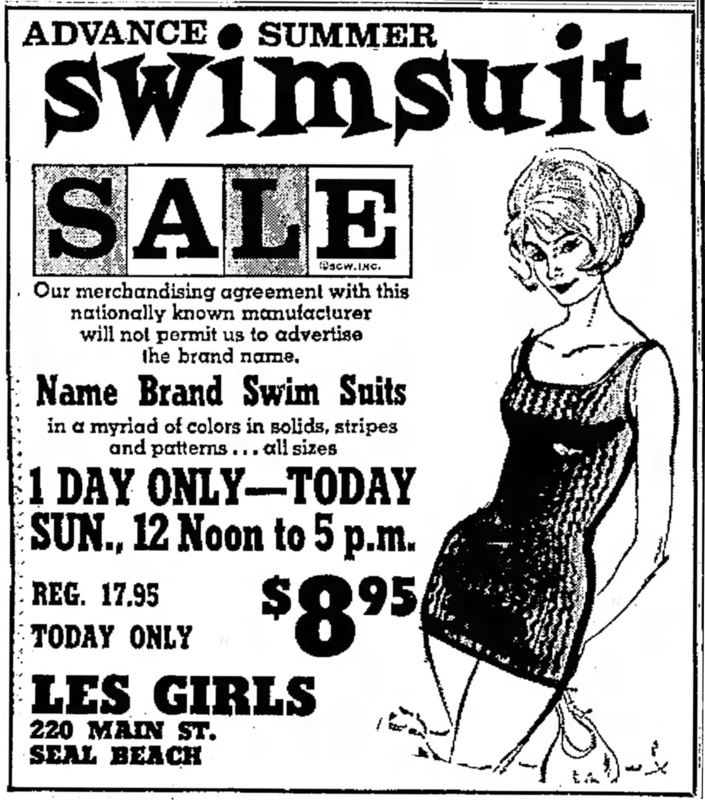 On this date in 1965, the Long Beach Independent ran the follow ad for Phil Roth’s K & R Scandinavian Imports on Main Street. 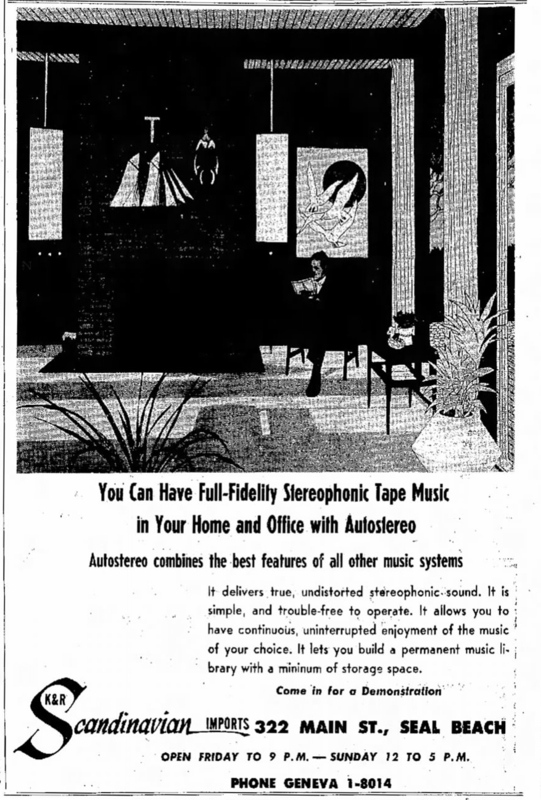 Today you can’t find imported furniture, glassware, and high fidelity audio electronics at 322 Main Street, but you can eat at our local European inspired restaurant and bakery, Crema Cafe & Artisan Bakery. On this date in 1919, the Santa Ana Register reported that the Red Cross in Westminster finished its last batch of sewing and, having fulfilled its quota until further need arose, decided to celebrate with a picnic at Anaheim Landing. A picnic dinner was spread on the tables, celebrants indulged in conversation, and the more adventuresome waded in the waters. All in all, forty-two people attended, including children and two honorary members, Meessrs. R. E. Larter and C. C. Murdy. World War I had ended in November 1918, but volunteer relief efforts continued in 1919 to bring food, clothing, and medical supplies to a Europe devastated by four years of unimaginable warfare. Like many people across the United States and Canada, the forty-two Red Cross volunteers sewing in Westminster were a part of the monumental push alleviate the suffering and needs of people halfway across the world. I hope they had a grand time in Anaheim Landing. 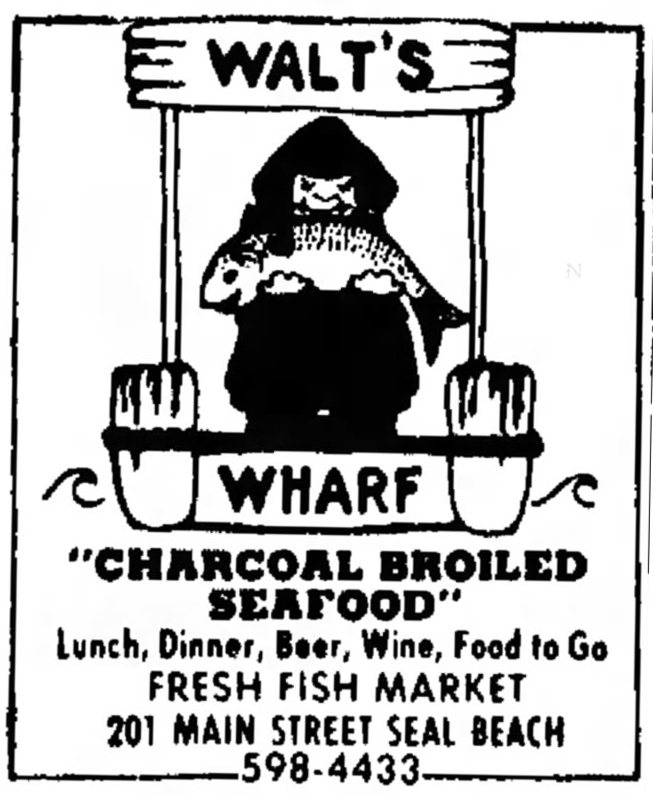 On this date in 1971, the Long Independent ran the following ad for a popular new Seal Beach restaurant that had been open a scant six months at 201 Main Street. On this date in 1965, the Orange County district attorney’s office charged Larry Doyle Lyons, 20, and John Warren Hilliard, 18, of conspiracy to prevent Alan M. Lennot, 17, from going to combat duty in Viet Nam. Lennot, a paratrooper stationed at Ft. MacArthur, was scheduled to go to Viet Nam on April 21st. Seal Beach police office Philip Bettencourt responded to a call reporting that two men were trying to murder a third man at the west end of Ocean Avenue. When Bettencourt arrived on the scene, the three men were in a car. The third man was unconscious, and the other two were trying to remove his boot. The initial story was that the unconscious man was very drunk and injured his foot stumbling over a rock, but the story changed later when they were questioned further at the police station. The new story was that Lennot did not want to go to Viet Nam, and Lyons and Hilliard decided to help him. They considered shooting him in the leg, but instead choose to give him whiskey and a sleeping pill and then drop a fifty pound rock on his ankle. They insisted to Bettencourt that they acted out of friendship for the victim. Lennot remain unconscious throughout the ordeal and was taken by ambulance to Ft. MacArthur and then transferred Camp Pendleton. Lyons and Hilliard were later released from Orange County Jail on $1,100 bail each with a hearing set for April 27. Both Lyons and Hilliard have passed on, and I can find no trace of Alan M. Lennot beyond this story to confirm whether or not he went to Viet Nam or if he returned to live a fruitful life. There’s also some blunt doubt as to whether Philip Bettencourt was a police officer or a worker for the Seal Beach city administration, and I have a couple lines out to verify his position and see if more can be added to this story. It’s possible that the original Long Beach Independent story was written by the city desk based on notes or a call from a field reporter, and that there were assumptions and errors made in name spellings and job positions. I’ll update if I get more information. On this date in 1953, Seal Beach citizens voted to ban gambling in the city by a narrow margin. The votes against gambling tallied at 848 against 811 for legalizing gambling. 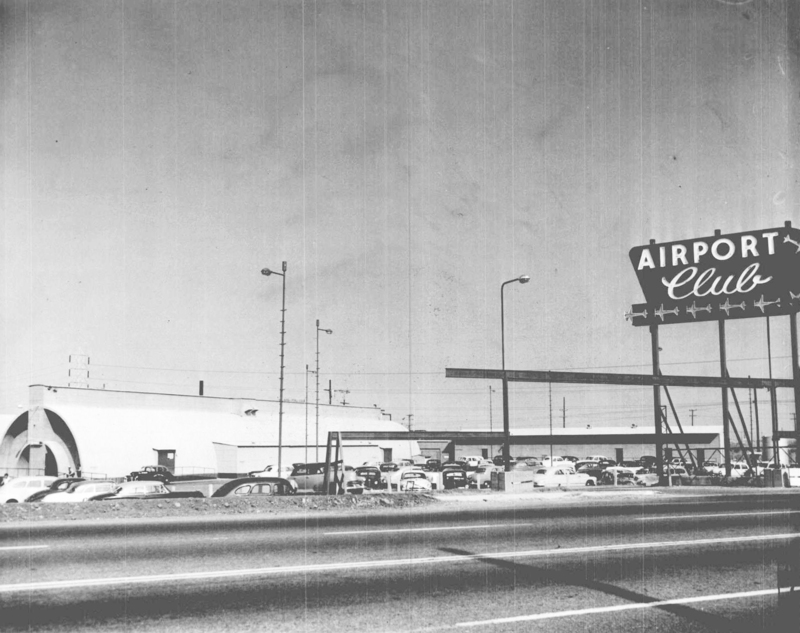 The city had previously voted 761 to 661 in October 1952 to scrap an ordinance that allowed the Airport Club, a poker and bingo establishment to operate. The April 14th election had been initiated and funded by Airport Club owner William Robertson to prevent the club from closing on May 20. This would not be William Robertson’s final attempt to keep the Airport Club from closing permanently. The Long Beach Independent estimated that the around-the-clock 24/7 gambling club was racking in a million dollars in revenues annually, a cash flow anyone would be reluctant to see go away forever. Many colorful strategies were concocted to revive the Airport Club, but local anti-gambling forces ultimately prevailed in keeping gambling dead in Seal Beach. The Airport Club remained closed until Robertson revived the location as a teen dancing club in the sixties, The Marina Palace. On this date in 1916, the Santa Ana Register reported that the Anaheim Amusement Company had incorporated with a capital stock of $15,000. The new corporation was formed to put on a new concession at Seal Beach called, “Barrels of Fun and Racing Ponies.” The directors of the Anaheim Amusement Company were Fred A. Dyckman, Leora E. Newcombe, E. H. Heying, George Bishop, and John Schumacher Jr.. In June of 1916, Santa Ana Register reported that the Anaheim Amusement Company planning to build a movie theater, a high-grade restaurant, 100 to 200 cottages, and various other attractions where Richardson’s Bowling Alleys and Bath Houses stood in Anaheim Landing. These ambitious plans were never fulfilled, and that was the final mention of the corporation in the newspaper. The directors all remained active in Anaheim commerce and real estate for years to come. Shoppers looking for swimsuit bargains at the same address today will find themselves in Purple Galore and More. On this date in 1914, the Guy M. Rush Company hosted a special promotional excursion to Seal Beach. A special train left San Bernardino at 8 a.m. with seats reserved for the holders of fifty special $2.35 tickets for the excursion. Tickets were also allotted for purchasers in Riverside, Ontario, and Pomona, all cities with stops for boarding on the route to Los Angeles, then Long Beach, and finally Seal Beach. The price included a free lunch and free Saturday band concert. This was the second of two heavily promoted Seal Beach excursions from San Bernardino in early 1914. The first excursion on March 22 was covered in this post. Like the earlier excursion, the real purpose was to sell city lots. Sales must have been disappointing because this was the last such excursion. The Guy M. Rush would continue marketing Seal Beach real estate to Los Angeles County, Long Beach, and Orange County, but these three ads from March and April 1914 featuring cartoonist Henri De Kruif’s seals were the last attempts to hook Riverside and San Bernardino County residents into buying lots in Seal Beach. 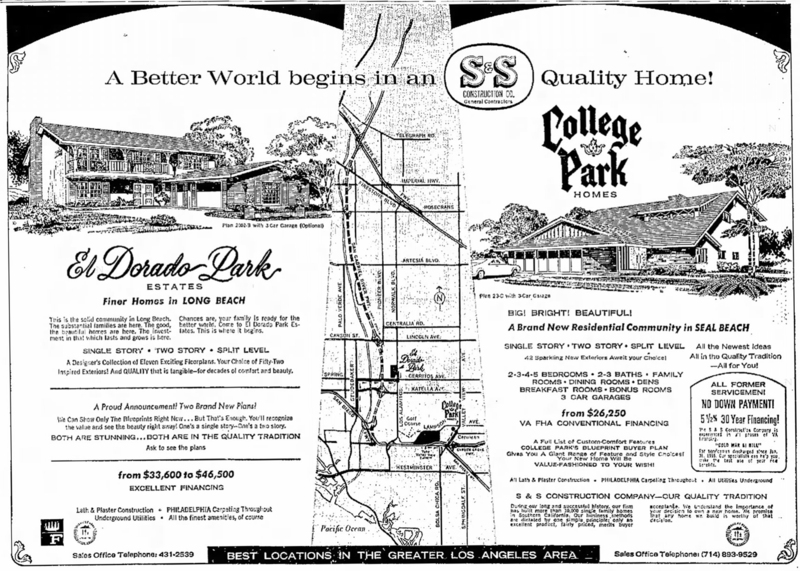 On this date in 1966, the Long Beach Independent ran this real estate ad for homes in College Park and El Dorado Park Estates. On this date in 1971, John Shelby Burrows, fifty-eight, of 1201 Marlin Avenue, was sentenced to 5-to-15 years in prison after pleading guilty for the murder of Claude LaBean, thirty-nine, of 459 Galleon Way. The murder occurred on October 22, 1970 at the Red Candle in the Seal Beach Shopping Center on Pacific Coast Highway. Burrows had been escorted out of the restaurant’s bar by LaBean and another man after a barroom brawl. Burrows returned twenty minutes later after retrieving a .38 pistol from home and shot LaBean three times in the chest as LaBean was leaving through the rear exit. Burrows re-entered the Red Candle where bar patron disarmed him. Burrows then fled the scene and was arrested a short time later a block from his home by Seal Beach Police. The murder wasn’t the only source of notoriety for the Red Candle Bar. A month before the murder, a two-week investigation into a prostitution operation at the Red Candle Bar resulted in the arrest of three women and a man. Perhaps this notoriety motivated Joseph M. Beard, the new owner of the Red Candle Inn, to rename it The Red Velvet Inn in February 1971. The only crime on record for the Red Velvet Inn was how tempting chef Ernesto Brock’s new menu was — offering New York steak superba, abalone stuffed with crab, and pan-fried abalone with a choice of soup or salad, hot garlic toast, baked potato or potatos au gratin. One oddity to this story is that Mr. Beard had represented the previous owner, Peter Trama, in a dispute with the city over a variance to serve liquor that lasted throughout 1970 and into early 1971. It appears that the change of ownership (and chef) resolved the liquor issue, but the Red Velvet Inn didn’t last far into 1971. By late October, the address was occupied by Pat’s Electric and Lighting. John Shelby Burrows was out of jail and living in Huntington Beach by 1977. He died on March 6, 1990 at the age of seventy-six.